Join us Saturday, April 28th to celebrate the height of the spring season with a three-hour floral arranging course taught by Semia of The Floral Reserve and Sierra of Poppies & Posies and The Floral Society. Using The Floral Reserve’s studio, Semia will lead students through a discussion about seasonality, color and textures to consider when designing floral arrangements. Sierra will guide students through a hands-on workshop focusing on designing low, lush garden-inspired arrangements. 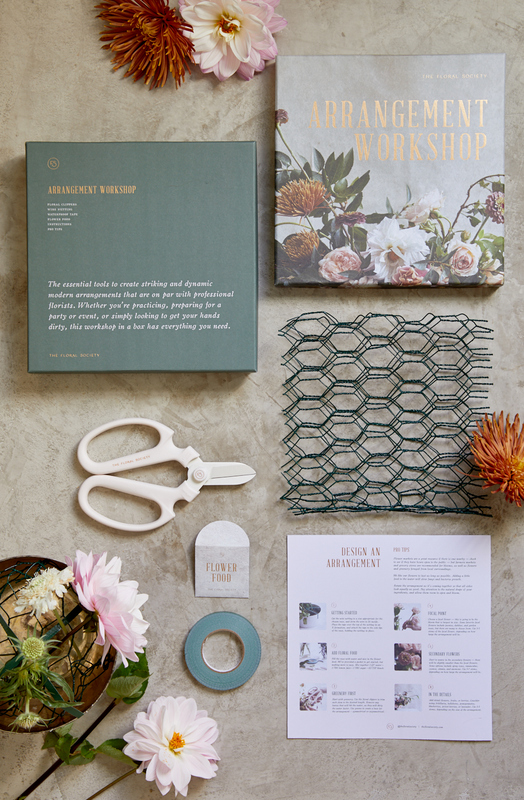 As a group we’ll go through a step-by-step process to designing loose, organic arrangements. Each student will design their own arrangement to take home. The Floral Reserve & The Floral Society have a strict no refund, no credit, no transfer policy. 1. The Floral Society Arrangement Workshop box (pictured above! ): Japanese floral clippers, floral netting, floral tape, flower food, tips & tricks guide, and access to online tutorials. Don’t wait! Sign up here.